Creamed spinach with artichoke is a top-shelf side dish that is sure to impress your guests-just don't tell them how easy it is to prepare! This is my personal favorite side dish to serve with a grilled steak. A few simple modifications and you have the makings of a fabulous spinach and artichoke dip. Prepare the frozen spinach as directed on the package; drain if necessary. If using fresh spinach, rinse well and set aside to drain. Pat dry with a paper towel. Slice the shallots and artichoke hearts and chop the garlic and set aside. Add 1 tablespoon of butter to a sauté pan over medium high heat. When melted and starting to foam, add the shallots and sauté until starting to clear. Add the artichoke hearts and garlic and continue to sauté. Add salt and pepper and the remaining tablespoon of butter. When starting to melt, add the heavy cream; starting with about 1/2 cup. Bring to a boil then lower the heat to maintain a simmer; continue stirring and shaking the pan until starting to thicken. Add the spinach and blend together. Stir in the Romano cheese. Taste for salt and pepper and add if needed; continue to simmer until thickened to a creamy consistence. 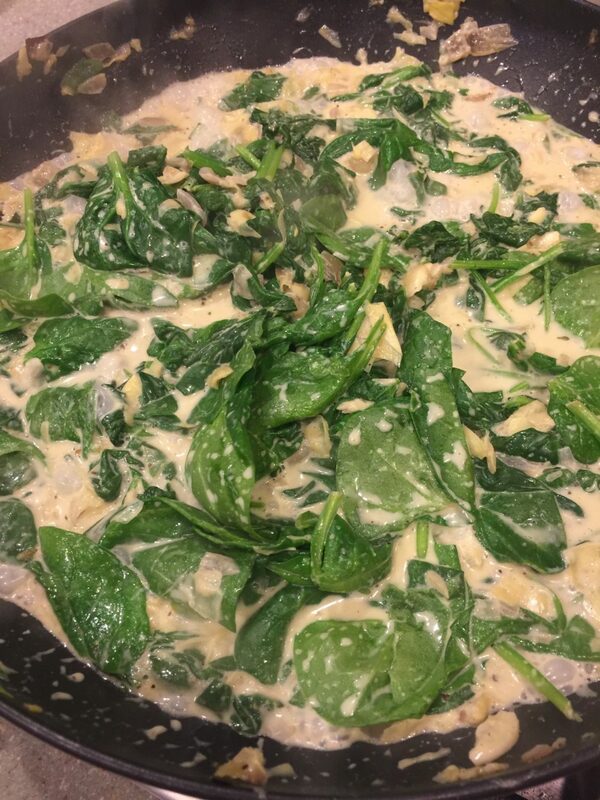 This recipe works well with fresh spinach (pictured above before it thickened), but you need at least a pound because it reduces down. Probably my favorite is using frozen spinach that can be steamed in the microwave. Frozen spinach in a block also works, but make sure to drain off all the liquid in a colander or strainer then squeeze out the remaining water before using. 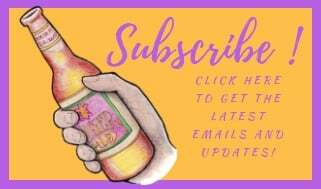 Just about every authentic New Orleans restaurant serves gumbo, maybe turtle soup and a New Orleans original-Oyster Artichoke Bisque. 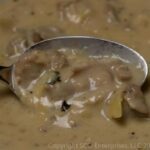 This rich soup pairs the wonderful flavor of fresh gulf oysters with the distinctive taste of artichoke. 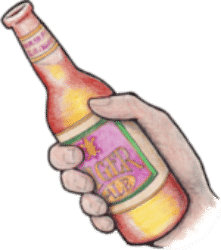 One bite and you’ll be hooked! 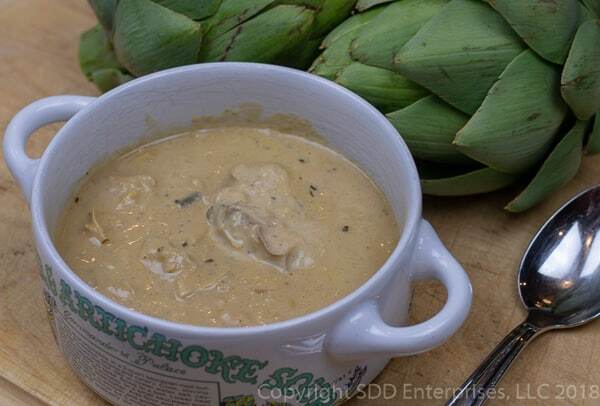 A New Orleans original: Oyster Artichoke Bisque, a rich creamy soup that pairs the wonderful flavor of fresh gulf oysters with the distinctive taste of artichoke. You won't believe how something that tastes so fantastic could be this easy to make! Drain the oysters in a strainer and reserve the liquid. Set aside while they drain. Chop the artichoke bottoms, yellow onions, green pepper, celery and garlic and place in one bowl. Chop the artichoke hearts and green onions and place each in their own separate bowl. Measure all other ingredients except the stock. In a heavy bottom dutch oven, melt the butter over medium to medium-high heat until foaming. Sauté the artichoke bottoms, onions, green peppers, celery and garlic until clear and starting to brown, about 15 to 20 minutes. Remove the vegetable mixture with a slotted spoon to a small food processor. Puree the vegetable mixture and set aside. In the dutch oven, melt 1/2 cup butter until foaming, add the flour and stir to make a light roux, about 4 or 5 minutes to get the flour taste out. Mix the pureed vegetables completely into the roux, add about half of the creole seasoning and white pepper and simmer for about 5 minutes, stirring often. Add enough chicken stock to the oyster liquor to make 5 cups of liquid. Leave the oysters in the strainer and set aside, reserve all the liquid that continues to drain. Add the oyster juice/stock to the roux/vegetable mix, starting with small amounts and stirring to completely blend everything together before adding more. Once about half of the liquid has been added in this way, add the remainder, stirring completely. Bring the mixture to a heavy simmer. Add the chopped artichoke hearts and mix well. Reduce heat and simmer for 15 to 20 minutes, uncovered. Add the heavy cream and stir together until completely blended, simmer another 5 minutes. Add the oysters a few at a time, stirring well in between-make sure to add any oyster juice that has accumulated. Add the green onions and the remaining Creole seasoning and white pepper and mix well. Simmer about 5 minutes until the oysters are curling up on their edges and are cooked. Taste for seasoning and add kosher salt to taste. The oysters may be salty so remember to taste the bisque before you add salt. Cover and remove the bisque from the heat and allow to sit for about 15 minutes before serving. To drain the oyster, place a strainer or small colander over a 4 or 8 cup glass measuring cup. Place the oysters in the strainer and set in the refrigerator. When ready to use the juice, empty the measuring cup into another vessel and add enough stock to make 5 cups of liquid. Place the strainer with the oysters over the original measuring cup and return to the refrigerator, they will continue to drain and you should add that extra oyster liquid into the bisque when adding the oysters. Be careful adding salt. Many commercial creole seasonings contain salt and the oysters and oyster juice could be salty. Taste the bisque after the oysters have simmered for 10 minutes and add kosher salt to your liking.